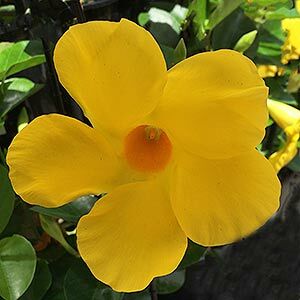 If you love tropical looking flowers, then Dipladenia could be worth a look, especially if you are looking for a more compact plant. Technically speaking these useful garden plants are in the Mandevilla family, however the growth habit is different. When asked about the difference between these two related plants, the answer is fairly simple,Mandevillas are vigorous climbers. Dipladenia are more of a bushy lax plant. Actually regarded as a form or sub species of Mandevilla sanderii rather than its own species this leads to a little confusion with with names. All Dipladenias are actually Mandevilla sanderii cultivars, Dipladenia is the common name, but it sounds like a botanical name. And to further confuse, some white Diplandenias are Mandevilla boliviensis cultivars. So Dipladenia is another name for a compact form variety of Mandevilla sanderi. Foliage also differs a little, the leaves are narrower and more lancelot in shape. This is where the difference ends. Care is virtually the same. In warmer climates Dipladenia will flower almost year found, they make great plants for containers. In cooler areas they will have flowering limited to summer, and will need protection from frosts over winter. Although these are plant that like warmth, they do not like direct hot afternoon sun, so filtered afternoon light in a warm position is best. These are a plant that like warmth, they also like moisture. They flower well in bright light, however you will find that very bright filtered light is best. Moisture needs to be controlled, Dipladenia do not like wet soggy soils, overwatering can kill them. Lack of moisture is also a problem. Growing in containers is a good option, if you choose the right one. It needs to be big enough to enable the root system to remain cool. Use a good quality potting mix with some well rotted compost mixed in. Mulch around the plants to maintain that cool root run. These are also a hungry plant, they do like a humus rich fertile soil. A liquid fertiliser every 2 – 3 weeks when in active growth is usually sufficient. They do like a warm sunny position and can reach 3m+ in good conditions. Flowers are usually a brilliant pink such as ‘Red Riding Hood’, or white. Yellow flowers are also available. A well draining potting mix is essential and protection from frosts is need in cooler areas. These wonderful flowering plants grow well from SE Queensland to further north. They will grow as far south as Melbourne in protected warm positions. As we move south, consider a warm sheltered position, or grow as a patio plant. This is fairly simple, just tip prune on a regular basis when the plants are not in flower, or are not flowering much. You can prune back harder in winter to re structure the plant. Leaves turing yellow and falling off Dipladenia are usually a sign of cold weather, these plants need warmth. This problem can also be caused by overwatering. Dipladenia Marbella ‘Hot Pink’ – Lipstick Pink flowers on a compact plant. Dipladenia ‘My Fair Lady’ – White flowers tinged with pink, long flowering and excellent for hanging baskets. Dipladenia ‘Scarlet Pimpernel’ – Mid to deep red flower. Dipladenia ‘Rio White’ – Good clean white flowers. 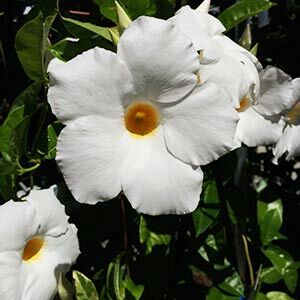 Dipladenia is the Brazilian Jasmine, a climbing plant, however with a bushy habit that makes it a versatile garden plant. With brilliant trumpet shaped flowers well suited to growing in a pot or container as long as you can provide a climbing frame for it. The main difference is that these wonderful plants do not have the same vigorous climbing habit as Mandevilla. This makes then well suited to growing in containers as well as in the garden where they can be pruned to a rounded shrub. Container growing is well suited to cooler climates so that plants can be moved to a protected position over winter if needed. Humus rich moist soil or potting mix. Keep at above 8C and frost free at all times. Water during active growth as soon as the soil at the top of the pot begins to dry. Fertilise avery 3 weeks with a liquid fertiliser. Use a slow release fertiliser in spring and again early summer. Prune as needed to maintain shape and size.